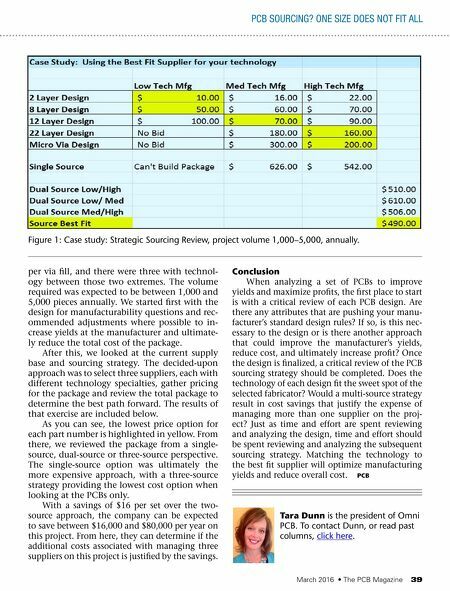 March 2016 • The PCB Magazine 39 Conclusion When analyzing a set of PCBs to improve yields and maximize profits, the first place to start is with a critical review of each PCB design. Are there any attributes that are pushing your manu- facturer's standard design rules? If so, is this nec- essary to the design or is there another approach that could improve the manufacturer's yields, reduce cost, and ultimately increase profit? Once the design is finalized, a critical review of the PCB sourcing strategy should be completed. Does the technology of each design fit the sweet spot of the selected fabricator? Would a multi-source strategy result in cost savings that justify the expense of managing more than one supplier on the proj - ect? Just as time and effort are spent reviewing and analyzing the design, time and effort should be spent reviewing and analyzing the subsequent sourcing strategy. Matching the technology to the best fit supplier will optimize manufacturing yields and reduce overall cost. PCB Tara Dunn is the president of omni PCB. To contact Dunn, or read past columns, click here. pCb sourCing? one size does not fit all per via fill, and there were three with technol- ogy between those two extremes. The volume required was expected to be between 1,000 and 5,000 pieces annually. We started first with the design for manufacturability questions and rec- ommended adjustments where possible to in- crease yields at the manufacturer and ultimate- ly reduce the total cost of the package. After this, we looked at the current supply base and sourcing strategy. The decided-upon approach was to select three suppliers, each with different technology specialties, gather pricing for the package and review the total package to determine the best path forward. The results of that exercise are included below. As you can see, the lowest price option for each part number is highlighted in yellow. From there, we reviewed the package from a single- source, dual-source or three-source perspective. The single-source option was ultimately the more expensive approach, with a three-source strategy providing the lowest cost option when looking at the PCBs only. With a savings of $16 per set over the two- source approach, the company can be expected to save between $16,000 and $80,000 per year on this project. From here, they can determine if the additional costs associated with managing three suppliers on this project is justified by the savings. Figure 1: Case study: strategic sourcing Review, project volume 1,000–5,000, annually.